The Sparrow Bakery produces enormous flavors in the way of hand-rolled croissants, pastries and rustic breads. The Victorian Café, aka “The Vic,” was recently named Best Brunch in Bend by Central Oregon Magazine. Chow, also a champion of local farms, has your traditional eggs and griddle offerings mixed in with a host of unique fare. Breakfast in Bend is not for wimps. That’s because if you’re tucking into your first meal of the day in this outdoor playground, it’s likely that you’ve earned it. Maybe you were skiing big pow Mt. Bachelor or ripping up the singletrack at Phil’s Trails. Perhaps you spent sunrise casting for steelhead on the Deschutes River or scaling a route at Smith Rock State Park. Whatever the case, we’re certain you’ll find these refueling options so delightful you’ll get right back out there. Pull up chair at Jackson’s Corner, Chow, Victorian Café, Sparrow Bakery or McKay Cottage. 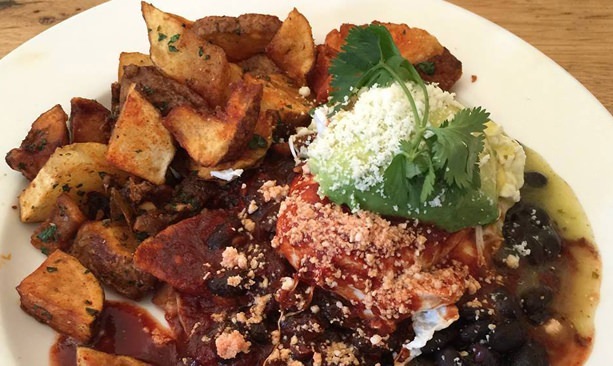 With Eastside and Westside locations, Jackson’s Corner is the go-to spot for lunch and dinner as well as breakfast. Locals flock here for weekly specials and an avowed dedication to fresh, local and organic ingredients. Try the Green Eggs & Ham, Mushroom Gravy & Biscuits (vegetarian) or the brioche French toast stuffed with cream cheese and topped with fruit compote. Chow, also a champion of local farms, has your traditional eggs and griddle offerings mixed in with a host of unique fare, like the Blackstone — a concoction of cornmeal-crusted tomatoes, smoked bacon, sautéed spinach and poached eggs under a Béarnaise sauce — and the Caesar — a corn cake topped with poached eggs, avocado, queso fresco, roja, verde and Hollandaise sauces. A favorite among locals for more than 30 years, The Victorian Café, aka “The Vic,” was recently named Best Brunch in Bend by Central Oregon Magazine. 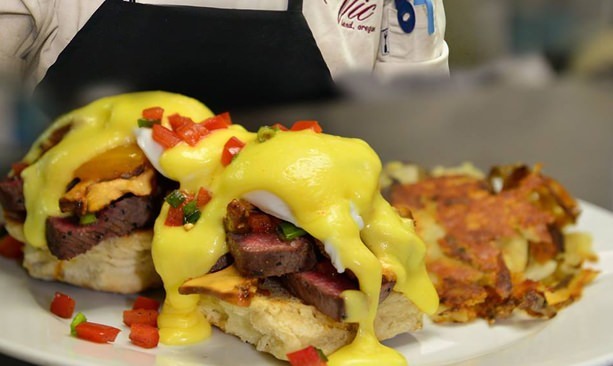 Sit inside the cozy house or outside on the patio and enjoy a staggering menu of specials — with 10 choices of eggs benedict alone — and an award winning Bloody Mary from the full bar. 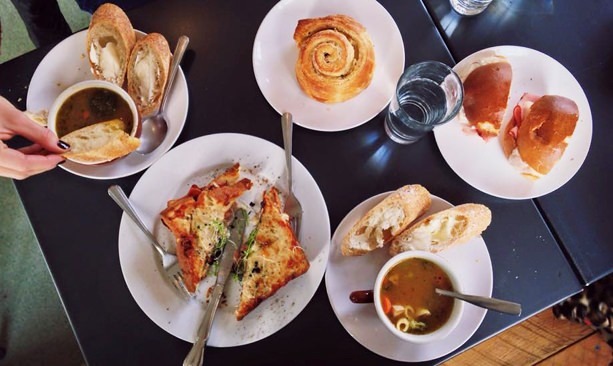 The Sparrow is a wee bakery in the Old Ironworks Arts District that produces enormous flavors in the way of hand-rolled croissants, pastries and rustic breads. The bacon breakfast sandwich is like a tiny miracle made of a buttery croissant, creamy poached egg, bacon, avocado and arugula aioli. And don’t miss the Ocean Roll. Check out a second location at Northwest Crossing. The former home of Bend pioneers Clyde and Olive McKay, McKay Cottage Restaurant has won the Best Breakfast Award from Bend’s The Source Weekly for six years running for what it calls “creative comfort food.” Relax in this charming 1916 Craftsman bungalow and enjoy such offerings as oatmeal pancakes, carnitas breakfast tacos and the Smith Rock Benny.